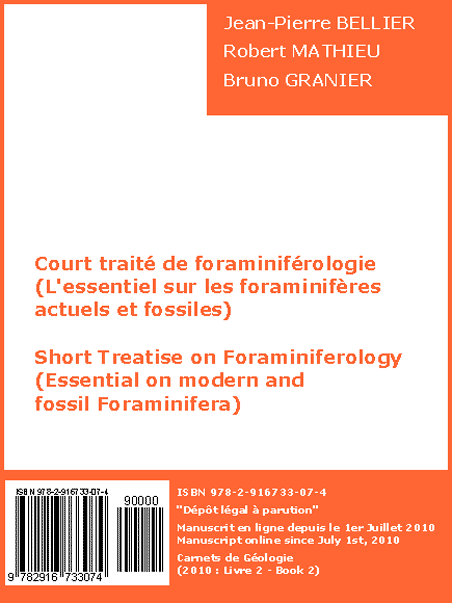 Book 1  : JK2018 - International Meeting around the Jurassic-Cretaceous Boundary, by Bruno GRANIER (ed.). Abstract: To summarize, 74 people from 25 countries (Africa: Algeria, Morocco; Americas: Argentina, Chile, USA; Asia: China, Iraq, Japan, Jordan, Lebanon, Qatar, Thailand, Turkey; Europe: Denmark, France, Germany, Italy, Netherlands (the), Poland, Romania, Russian Federation, Slovenia, Spain, Switzerland, United Kingdom), as well as 15 national or international learned societies listed as scientific partners, contributed to this meeting around the JK system boundary hosted by the Muséum d'Histoire naturelle de Genève (Switzerland). 176 authors and coauthors gave 59 contributions (6 keynotes, 33 presentations, and 25 posters including 5 to supplement regular oral presentations or keynotes). 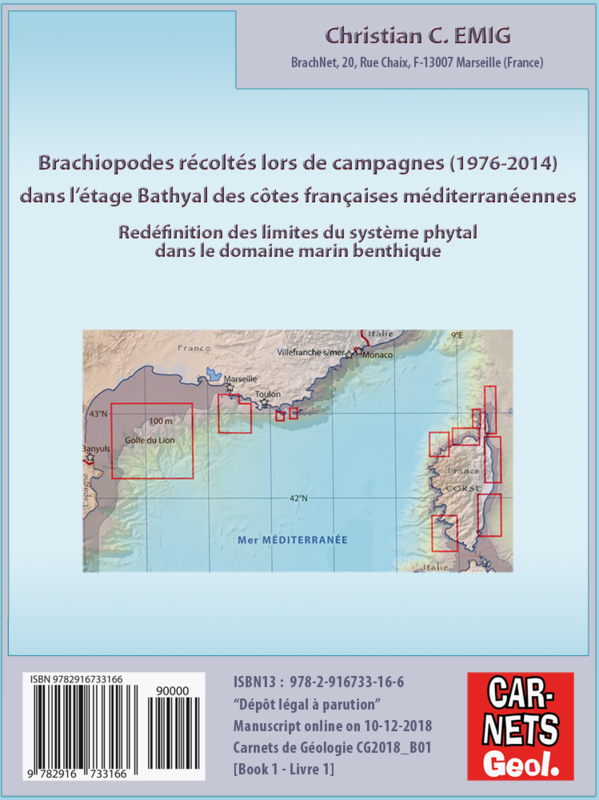 Book 1  : Brachiopods sampled during expeditions (1976-2014) in the Bathyal Zone of the French Mediterranean coasts. Redefinition of the boundaries of the phytal system in the marine benthic domain, by Christian C. EMIG. 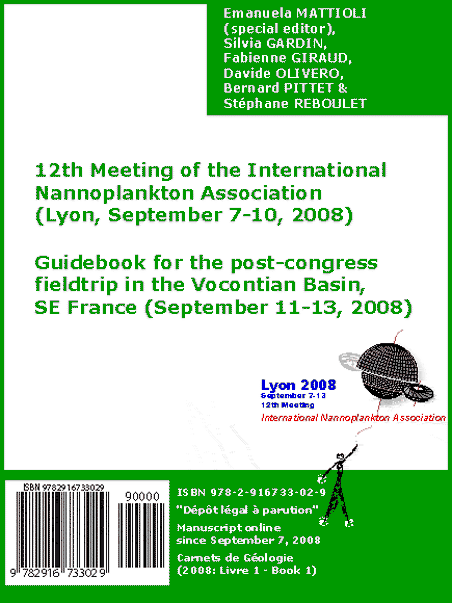 Abstract: The distribution of brachiopods along the French Mediterranean coast, especially in the Bathyal zone, was studied in detail from 1976 to 2014 being one of the main objectives of the RCP-CNRS No 728, that took place during the years 1983 to 1989. The data obtained during these campaigns constitute the main objective of this e-book, which focuses on five brachiopod species Novocrania anomala, Gryphus vitreus, Terebratulina retusa, Megathiris detruncata, Platidia anomioides and Megerlia truncata that occur in the Upper Bathyal zone. The e-book consists of nine chapters, of which the last two contain the data concerning all the stations studied, the distributional charts of the five species mentioned, included. The presence of these species in the Mediterranean biocoenoses has put in evidence a hiatus in the systematics based mainly in characters of the shell and rarely in phylogenetic analyses. Another important point that is addressed is the discussion of the validity of some species with fossil record, being Terebratula minor (= Gryphus vitreus), as well as of extant ones, i.e., Terebratula seminulum, chosen as examples. Finally, the infestation of G. vitreus shells by the Ostreobium alga led to reconsider the lower limit of the benthic phytal system and its bathymetric variations as far as in the Bathyal. Book 3 : Atlas of Antarctic and sub-Antarctic Brachiopoda, by Christian C. EMIG. 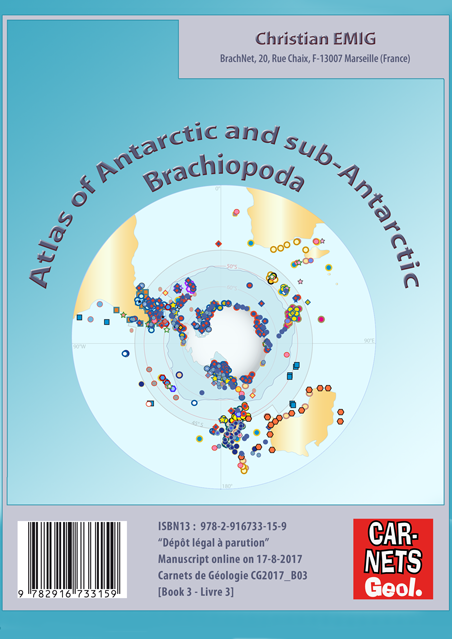 Abstract: The specific diversity of Brachiopoda is proposed for the first time in an atlas of the Southern Ocean with maps for each genus in the Antarctic and sub-Antarctic zones. The three sub-phyla Linguliformea, Craniiformea and Rhynchonelliformea are represented: 51 species, belonging to 35 genera occur on a surface area covering about 20% of World Ocean. The low diversity in those zones is confirmed by the occurrence of only 12.6% of the total number of extant species of brachiopods (402) and of 29.4% of that of the genera (119). The absence of reliable diagnoses in most of the species makes difficult some comparisons and attributions. 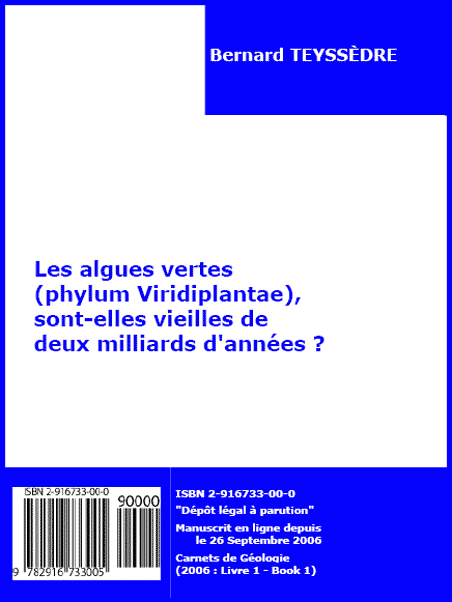 In the future several of these species and even genera could be considered as synonymous. 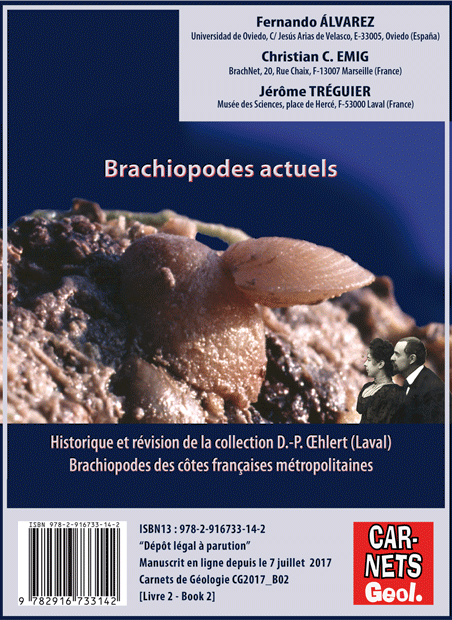 Book 2 : Recent brachiopods: History and review of the collection of D.-P. Œhlert (Laval); Brachiopods of the continental French coasts, by Fernando ÁLVAREZ, Christian C. EMIG & Jérôme TRÉGUIER. Abstract: The "Musée des Sciences de Laval" houses an interesting collection of Recent brachiopods mostly sampled during the first Monegasque and French oceanographic cruises in the second half of the 19th century. These were studied by D.-P. Œhlert (1849-1920), a specialist in fossil and extant brachiopods, who also obtained more brachiopods by exchange, from different parts of the world not sampled by the cruises, that also form part of the collections. Besides of this material, Recent brachiopods from the Monterosato (1841-1927) and Cailliaud (1787-1869) collections are also part of the Museum collections. The first part of this book presents Œhlert's remarkable collection dedicating special attention to the dredging localities that range from Bay of Biscay to Cap Horn or Newfoundland. In the second part, the 724 specimens (646 from the Œhlert Collection, 51 from Monterosato Collection and 27 from Cailliaud Collection) have been studied, photographically illustrated and briefly described and discussed. Systematic descriptions of 39 species included in 32 genera are provided. A selected synonymy for each species and the museum numbers of all the specimens are provided. The value of these collections is enhanced in a third part by an updated geographic and depth distribution of extant brachiopods along the French coasts. In the French Exclusive Economic Zone (Atlantic Ocean) and Ecological Protection Zone (Mediterranean Sea), the brachiopods are all epibionts. The morphology and the anatomy of the adult are briefly described, as well as the main characteristics of their natural history. Their bathymetric distribution ranges between littoral to Bathyal zone. Twenty seven species, referred to 22 genera, are listed with respectively six species in the Channel, 23 in the Atlantic Ocean and 11 in the Mediterranean Sea. The data on the geographical distribution of the brachiopods off the French coasts come almost exclusively from oceanographic expeditions. On the continental shelf, the brachiopods are generally cryptic, therefore not very easy to reach from the surface, requiring scuba diving, their density is low and their size small, often less than one centimetre. On the other hand, in the deep-sea, beyond the shelf break at nearly 100m, the diversity of the brachiopods is maximum with high densities, reaching several hundreds of individuals per square meter in the Upper Bathyal zone. This new synthesis constitutes an invaluable reference document for future studies of fossil and Recent brachiopod populations. 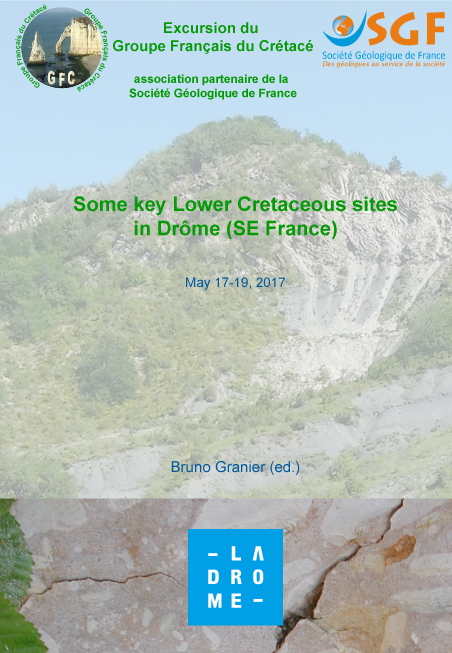 Book 1 : Some key Lower Cretaceous sites in Drôme (SE France), by Bruno GRANIER (ed.). Forewords: This guidebook was designed to accompany the attendees of a field excursion organized under the aegis of the "Groupe Français du Crétacé" and the French Geological Society in the Vocontian Basin of SE France (Department of Drôme) on May 17-19, 2017. It includes descriptions of visits to candidate sections for the bases of the Valanginian, Upper Valanginian, and Hauterivian stages or substage, as well as a stop at the site of the newly established Albian GSSP. Another purpose of the field trip was to present some Tithonian - lower Berriasian localities with megaslumps (involving several cubic kilometers of rock), debris flows and calcareous turbidites, as well as new material from the famous L'Estellon section. This Barremian age section supports the stratigraphic model for the carbonate Urgonian platforms developed by Clavel et al. (and contradicts the model of Arnaud and Arnaud-Vanneau). 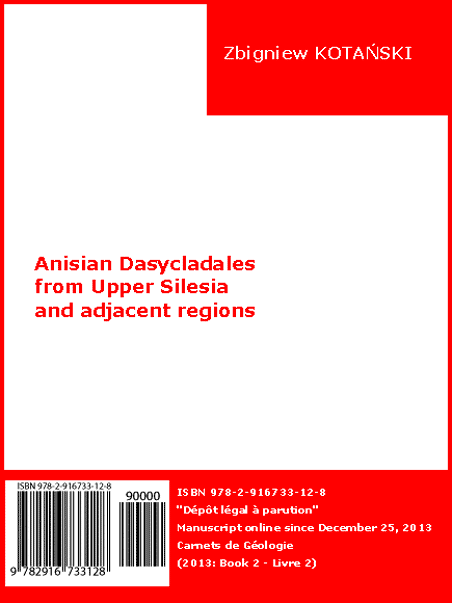 Abstract: Anisian Dasycladales (calcareous algae) from the Diplopora Dolomite of the Upper Silesia and adjacent regions of S Poland are revised. All previously reported taxa are critically reviewed and illustrated. New paleontological samples were collected from 74 outcrops and from 45 boreholes. The abundant material includes both specimens visible on fractured rock surfaces and thin-sectioned ones; 24 species of Dasycladales are identified, including three new species: Oligoporella chrzanowensis n.sp., Physoporella polonoandalusica n.sp., and Salpingoporella krupkaensis n.sp. Best-preserved specimens are illustrated in 39 plates. The identified species were compared with Alpine and Carpathian forms of stratigraphic importance. Six Dasycladalean local horizons are defined. The Pelsonian-Illyrian boundary occurs in the middle part of the Diplopora Dolomite. Its uppermost part, despite the presence of Diplopora annulata, belongs to the Illyrian, not to the Fassanian, as also corroborated by conodont correlations. The peculiar state of preservation (internal moulds and double tubes) is discussed; it is due to early syngenetic dolomitisation. The palaeoenvironment of the algae is determined as sublittoral. Dasycladales flourished upon a peri-Tethyan carbonate platform, widely connected with the Alpine-Carpathian seas. Five palaeoecological assemblages are recognized, differing in their bathymetric and turbulence conditions, and living in marine shoals and shallow basins separating them. The Upper Silesian platform was separated from the hypersaline Germanic Basin of the Middle Muschelkalk by banks and oolite and bioclastic barriers, blocking dispersal of marine biota. A wide connection existed with the Alpine-Carpathian seas, allowing immigration of High-Tatric, Krina and even South Alpine flora to the Upper Silesian Carbonate Platform. 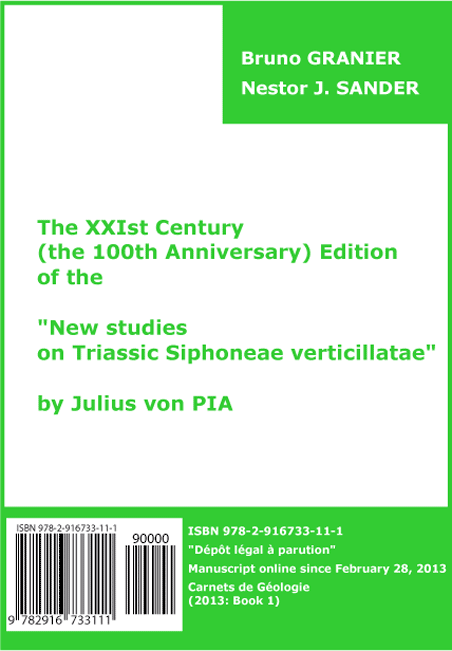 Forewords: This 21st century edition of Julius von Pia's 1912 memoir entitled "Neue Studien über die triadischen Siphoneae verticillatae" is brought to you by B. Granier (editing, photomicrographs) and N.J. Sander (translation). The artwork is due to A. Lethiers and B. Granier. The original 24 text-figures and 7 plates [II-VIII] were converted into 125 discrete photomigraphs, 5 figures and 56 videos. This research received support from the SYNTHESYS Project, which is financed by European Community Research Infrastructure Action under the FP6 "Structuring the European Research Area" Programme. A version printed on glossy paper was issued in late 2013 in: "Jahrbuch der Geologischen Bundesanstalt, Wien, Band 153, Heft 1-4, p. 239-300". 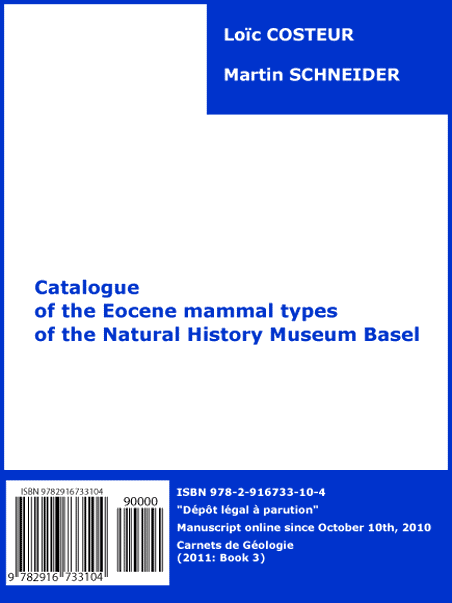 Abstract: This catalogue presents a list of the Eocene mammalian type specimens held in the collection of the Natural History Museum Basel (Naturhistorisches Museum Basel, hereafter NMB). After a close inspection of the very rich Eocene collection (several tens of thousands of specimens), a total of 51 valid holotypes (plus 16 invalid species) were identified together with 21 valid lectotypes and several hundreds paratypes, paralectotypes and syntypes. These types belong to 123 originally described species, of which 99 are still valid, 30 having been moved to another genus. 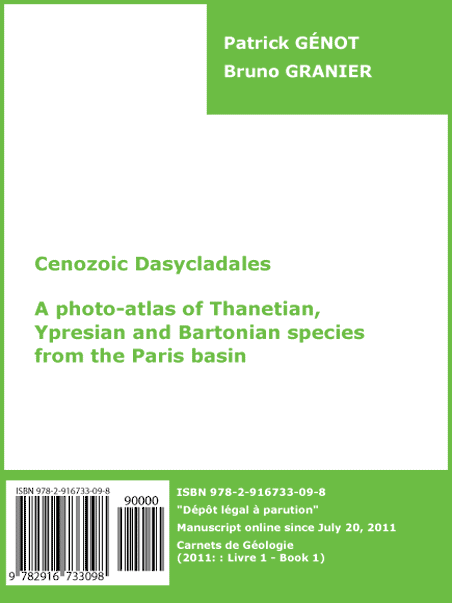 Introduction: Following the publication of the photo-atlas of living Dasycladales (Berger, 2006) and their fossil representatives from the Lutetian of the French Cenozoic basins (Génot, 2009), we propose a photo-atlas of 17 species discovered in the Thanetian, Ypresian and Bartonian sediments of the Paris basin. Cenozoic Dasycladales of the French sedimentary basins are noteworthy for the exceptional quality of their preservation. Although most fossil Dasycladales are known only in thin sections often difficult to interpret, the coatings of the Dasycladales in these basins, particularly in the Paris basin, are easy to extract from sandy sediments and then are examined under the electron microscope. This method of investigation facilitates greatly the identification of the external and internal features of each species. Foreword: After some forty years in the academic world and before abandoning a position as an employee of the State educational system to enter the new world of "pensioners", it seemed worthwhile to the first author (J.-P.B.) of this brief discussion to compile a short document that presents a synopsis of the knowledge acquired, taught and put to use for more than four decades. This fascicle reviews only the foraminifers, which, along with calcareous nannofossils, are the fundamental tools of modern biostratigraphy, used for worldwide oceanographic studies and for the correlation of oil wells. It deals essentially with the small foraminifers, that is those of modest size without a complex internal architecture. These include the planktonic foraminifers of which the rapid evolution and great dispersion permit the establishment of reliable biochronologic scales of reference. This short course is intended for students preparing for the CAPES (Certificat d'aptitude au professorat de l'enseignement du second degré = Certificate of Aptitude for a Professorship of Instruction in the Second Grade), for students working toward the Aggregation in Natural Sciences in pursuit of a scientific career in the universities or in the CNRS (Centre National de la Recherche Scientifique = National Centre for Scientific Research), and for students who hope to work in the oil industry where a specialization in the field of micropaleontology is considered useful and is still valued. It will also interest amateur naturalists and that portion of the general public attracted by the beauties of the microscopic world, now living, or extinct and represented only by fossils. 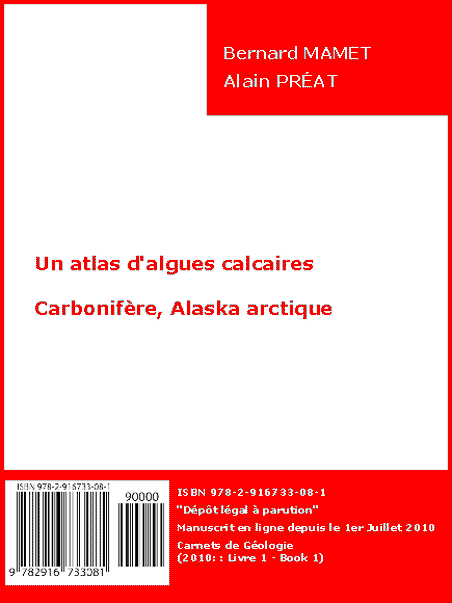 Abstract: An atlas illustrating 54 genera of marine algae and some microproblematica. They are observed in the field and in boreholes of the Lisburne Group throughout the Alaskan Arctic Cordillera (Brooks Range). Introduction: Dasycladales are unicellular green algae in existence since the Paleozoic era. 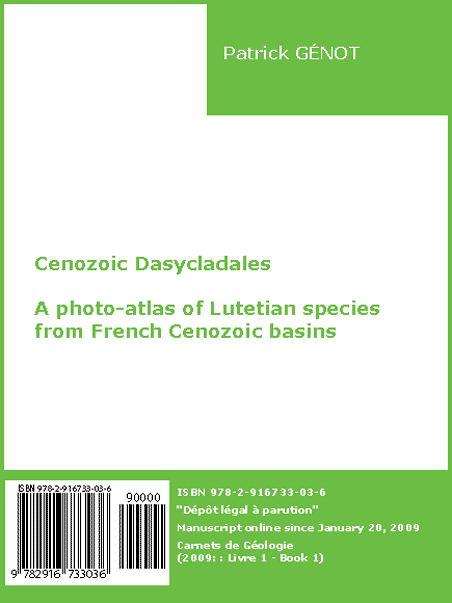 Dasycladales discovered in the Cenozoic strata of the French sedimentary basins are noteworthy for the exceptional quality of their preservation. Although most fossil Dasycladales are known only in thin sections, the coatings of the Dasycladales in these basins, particularly of those in Lutetian beds, are easy to extract from sandy sediments and then are examined under the electron microscope. This method of investigation facilitates greatly the identification of the external and internal features of each species. • Chapter 6. The Cenozoic of the Barrême syncline. Foreword: (by Filippo BARATTOLO) "Dasycladales, from whichever point of view they are observed, biological or paleontological, never lack in surprises for their elegant structural simplicity is associated with an extraordinary morphological plasticity. This is why their study is so exciting and compelling for those who have a regard for these algae. During 540 million years of evolution, periods of crisis or stagnation followed others of sudden diversification at both generic and specific levels. Their persistence in the paleontological record as autotrophic marine organisms linked to well-defined ecological conditions make Dasycladales a potentially valuable tool for the recognition of global changes on Earth during the whole of the Phanerozoic. On the other hand, the preservation and occurrence of dasycladaleans as fossils depend strictly on the presence of a calcified envelope which varies in occurrence or degree of development from species to species as well as from one growth stage to another. It is a common experience for the paleophycologist that parts of the fossil alga cannot be observed because they have not been calcified. As a consequence the systematics of fossil Dasycladales leaves open to interpretation (the function of laterals, vestibules, etc.). 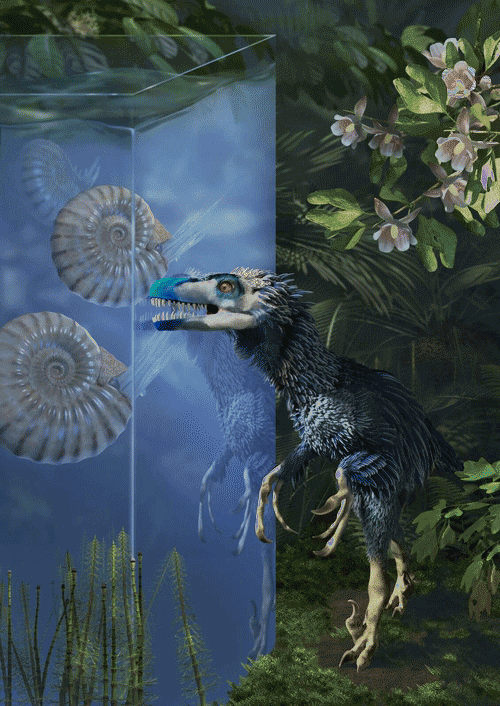 It is only through a continuous comparison to living counterparts that cannot be disregarded, and becomes more and more delicate on moving from the Cenozoic to Paleozoic, that can provide a measure by which the reliability of an interpretation can be judged. This is why the Sigrid Bergers Photo-Atlas of living Dasycladales is most welcome. This contribution not only adds useability to the previous elegant Berger & Kaevers (1992) volume, but integrates that work with new spectacular photos and details as well as an updated systematic scheme and a selected bibliography. 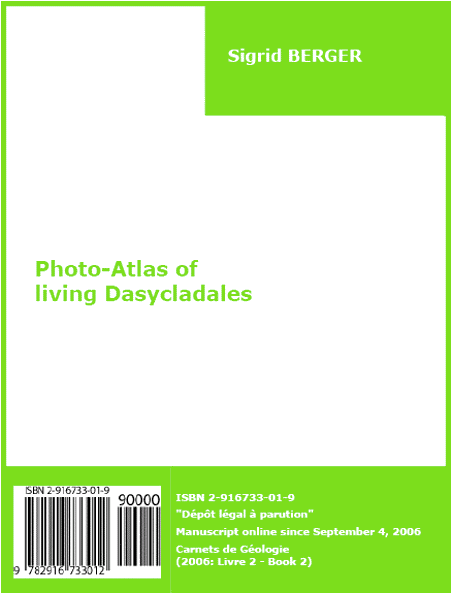 The Photo-Atlas of living Dasycladales is a helpful, easy-to-use tool to introduce biologists and paleontologists to the Dasyclad-world and to stimulate their interest in it. Moreover the electronic format will surely allow a broader public to become familiar with the extant dasycladaleans or to update their databases. I think that I express the sentiments of all phycologists and paleophycologists in thanking sincerely the Author for having made available to the scientific community her rich photographic documentation and Bruno Granier for his precious, steadfast efforts to promote the knowledge of Dasycladales through his employment of the web." or those concerning the beginnings of any form of life. Was he already thinking about the investigation that he was to carry out concerning the time when life was hidden, "La Vie Invisible" when he wrote the surprising politico-romanesque fiction around COURBETs sulfurous "Origine du Monde" (Origin of the World) and then transferred his interests from the archeology of our beliefs to a scientific search for our origins? Always passionately interested in the sciences concerning evolution, he has a quasi-encyclopedic knowledge regarding fossils and their descendants that specialists may well envy. The study of the first three billion years of the history of life is still in its early stages and is in full evolution. Ninety per cent of Precambrian fossils have been discovered in less than the last twenty years. In "La Vie Invisible" Bernard TEYSSÈDRE has integrated the findings of paleontology, biochemistry and molecular phylogeny. It is the first synthesis of what is now called Integrative Geology. We learn to appreciate a writing style, to which we are now unaccustomed, which only Anglo-Saxon authors seem capable of presenting. The author promises us a palaeontology of the Precambrian times to the light of molecular phylogeny. This well-aimed work lets us hope for a forthcoming synthesis of new data on the evolution of life since its origins." 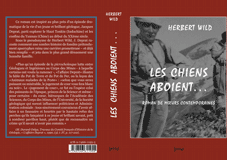 Reedition of a "novel of contemporary morality"
It is a novel by Herbert Wild, the pen name of Jacques Deprat, titled "Les chiens aboient... [The dogs bark...]" [Note: it is available in a French version only!]. Michel Durand Delga has added explanatory notes about Deprat's situation (fall from grace). 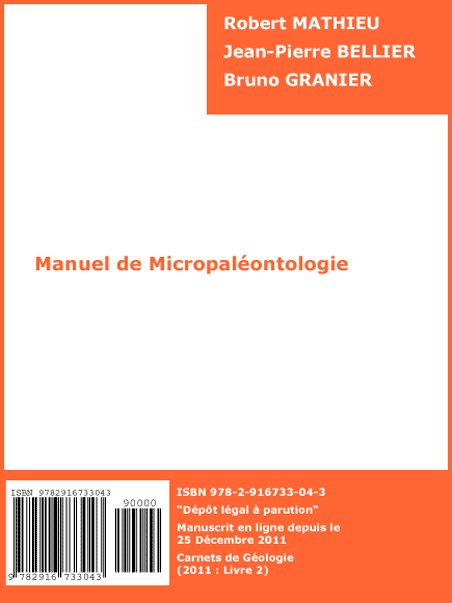 Edited by Jean M. Ollivier and Bruno Granier, the HTML electronic version is available free of charge. The paper-printed version, a pocket book (378 p.), is available since September 14th 2009 for 10 € only (shipping included) with the PayPal button below. Alternatively you can send a check of the same amount (drawn in € from a French bank) and your information (including the delivery address) to Jean M. Ollivier, Quartier Lassabaigt, F-64150 Lahourcade (France).